PRAY for the Church Jesus founded in the language He spoke at St Rafka 3rd Ecumenical Prayer Breakfast, Aug. 19. LEARN how to combat global persecution of the Church before it is too late for America. Help STOP GENOCIDE. 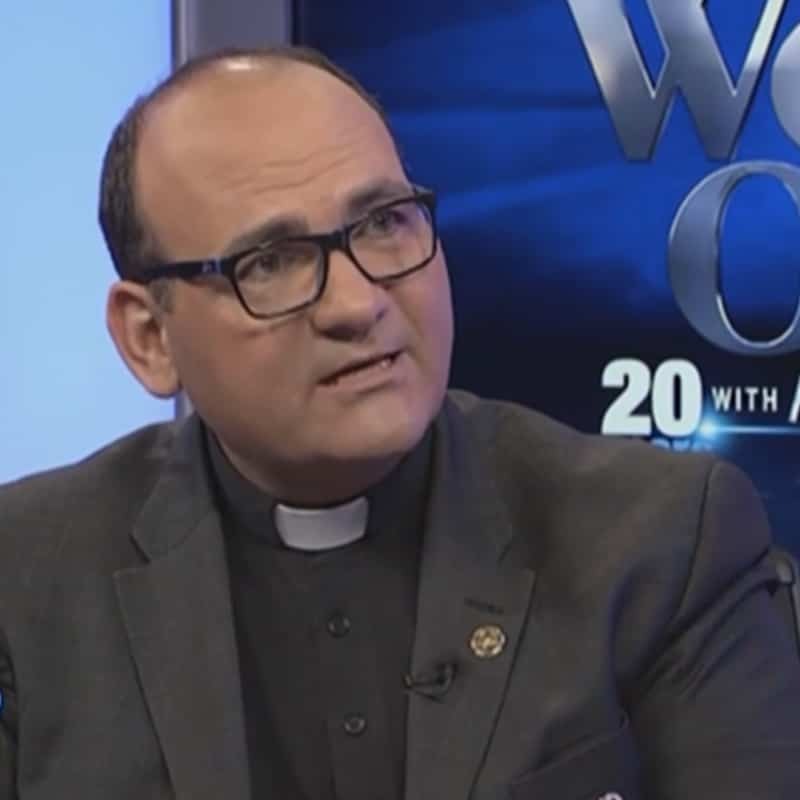 Enjoy an inner circle talk with Fr. Andre Mahanna giving updates from advocacy work in Washington, D.C. and the Middle East. Pray with Chorbishop Sharbel Maroun, Bishop Jorge Rodriguez and other Christian leaders. See an interactive presentation from the Children of St. Bernadette. Sponsored by the Eparchy of Our Lady of Lebanon and the Archdiocese of Denver. Book your $20 ticket now. Theme for this year is: Lebanon a P.L.A.C.E. for Faith, peace, love and coexistence for the Children of Abraham in the lands where Christianity was born. This breakfast, an “inner-circle” talk with Fr. Andre Mahanna and Frank Gaffney is an opportunity for people of goodwill to look intently at what threatens peace and foments hate instead of love against the West and Judeo-Christian principles upon which this nation was founded. Save Christian Middle East, Save America! Many seemingly impossible obstacles stand in the way of coexistence for the children of Abraham in the lands where monotheistic faith was born. But we believe a united effort of support for Lebanon can bring about the changes needed to strengthen and nurture peace, love and coexistence in the Middle East for religious freedom and the good of all mankind. The suggested donation is $20 and includes breakfast and access to the seminar with special guests including, Our Lady of Lebanon Chorbishop Sharbel Maroun, Denver Auxiliary Bishop Jorge Rodriguez, Denver Archdiocese Director of Communications Karna Swanson, and U.S.A. President of the Apostolic Union Fr. Andre Mahanna, Frank Gaffney of the D.C. based Center for Security Policy, Khalid Haider of the D.C. Yazidi Advocacy Group and Eric Kniffin a religious freedom lawyer. Jimmy Sengenberger will moderate a panel discussion of the speakers. Donations will benefit Apostolate of Our Lady of Hope / St Rafka Mission of Hope and Mercy. 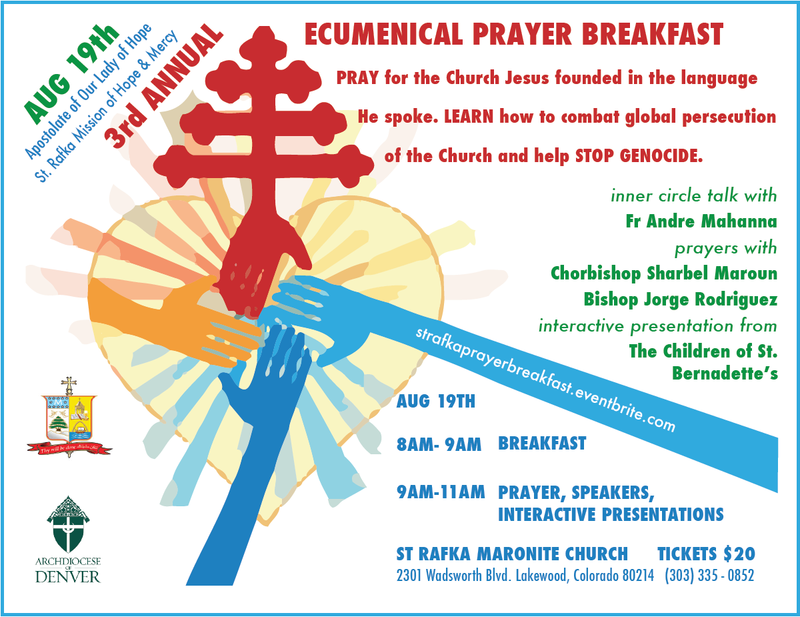 The Eparchy of Our Lady of Lebanon with the Catholic Archdiocese of Denver, the U.S.A. office of the Apostolic Union of Clergy and St Rafka Maronite Catholic Church in Lakewood, CO will again host the St Rafka International Ecumenical Prayer Breakfast with proceeds going to the USCCB recognized non-profit Apostolate of Our Lady of Hope / St Rafka Mission of Hope and Mercy. The suggested donation is $20.